Course Fee: $50 ($40 for students or if unemployed). What is self-compassion and how this practice can help to relieve symptoms of stress, anxiety, depression and isolation. How to start a self-compassionate practice using straight-forward practices such as the “Self-Compassionate pause” and “Soothe, Soften and Allow” developed by Dr. Kristen Neff. Simple body movements and breathing exercises that help to foster a self-compassionate practice. 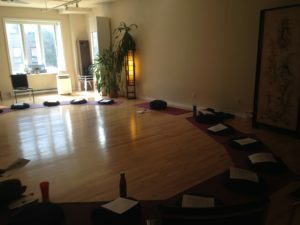 Mindfulness practices that will support a self-compassionate practice and bring a greater sense of connection with oneself, others and the present moment. What you can expect: You will be welcomed into an open and warm environment, where participants are invited to sit in a circle of cushions on the floor, or can use chairs or a comfortable sofa. The afternoon begins with an opening meditation to ground and settle you, where you will be invited to set your intention for the workshop. The core foundations of Self Compassion will be introduced in an interactive, bilingual discussion format and participants are free to engage at the level they feel most comfortable. Throughout the afternoon, theoretical concepts are followed by self compassion meditations and exercises to help individuals embody the concepts in a real way. There is a break for tea and cookies half way through, as well as a time for light body stretching. Emily is a trained teacher with the Center of Mindful Self Compassion and has received direct training under the guidance of Dr. Kristen Neff and Dr. Chris Germer. She has been teaching mindfulness-based groups for over 8 years and is excited to share her new passion for the growing area of mindful self compassion research and practice with you. I just wanted to tell you how much I've enjoyed taking the MBSR course with you. Not only have you been the perfect instructor -knowledgeable, patient, soothing and accepting - but your follow through is incredible! It's been a thoroughly enjoyable experience!